Clever use of the word 'faith' and the usual alliteration and so on. Scary that people are thick enough to buy all that cr4p though. I suppose it's the culmination of decades of exposure to advertising. No mention of who's bankrolling her, no mention of policy, no mention of anything substantive. These people scare the **** out of me. Edit: Title was supposed to say NLP not Nip. I'm sure her nip video is far more interesting. Sorry. Misread this as Palin's NIP video. I find that she brings out caveman urges within me. Politics wise - she scares me also. I hope she is just in it for the millions she is making now. What has it got to do with the BBC? Glad that there is no mag loaded - looks like the barrel would blow up in her face. Aren't US women supposed to be wearing thonged bikinis when they are photographed holding a AR-15? that was dire.and I'm a fan of hers in a way.she's definitely a case of less is more. Absolutely the best description for her, and her whole strategy relies on not actually saying anything important - only popular generalisation. Hells bells, lets get this baby on topic. I would. I bet you would too. An ex beauty queen spouts off and the world listens. "I believe in world peace, freedom from starvation and a warm gun." When I hear her and her cronies I think of scientology for some reason. Does anybody have a link to the video? What the "Whos Nailin Palin Video?" quite,she's great for repeating written speeches,but she flounders badly in open debate at the mo.I jsut can't see her making the cut in 2012.what irks me though,is that,much like Thatcher,women are of the right receive a far more rabid reaction from the bleeding heart liberals than their male counterparts.isn't it ironic. I really don't see that It's anything to do with rabid reactions from the liberal left, nor do I see that it's anything to do with Thatcher. Love her or hate her, Thatcher was very talented, and undoubtedly had what it takes to be a politician. 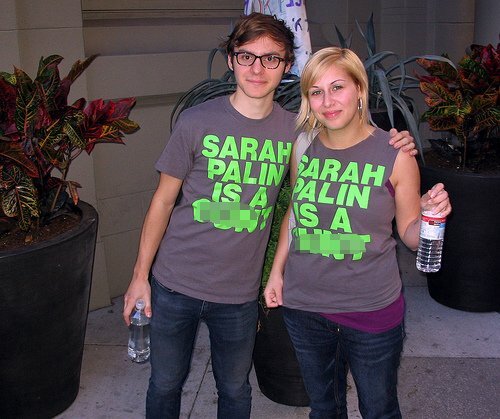 Sarah Palin does not. In case there is anyone out there who hasn't yet seen the famous interview....can you imagine Thatcher coming out with this stuff?? 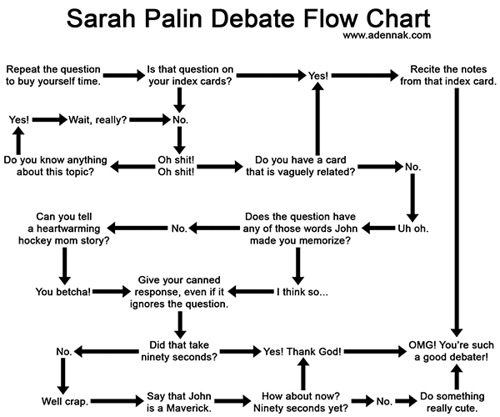 I don't like many Americans, but Ms Palin seems to bring out certain urges in me. Coming right back to the OP, it is very interesting to see the NLP/hypnosis techniques applied in the video. The pacing of the words, the emphasis on "I'm confident, I'm hopeful", strange emphasis on "morning" and "shaking it up" and probably other things I've missed. I don't know enough about the subject to properly explain what's being done, but enough to spot the intention of manipulation!